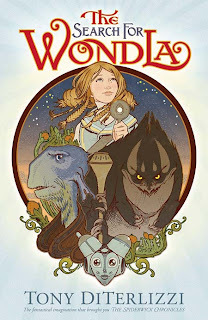 The Search For WondLa by Tony DiTerlizzi is about a young girl named Eva Nine, who has lived underground with a robot for all 12 years of her life. Eva has been wanting to go the "outside world" for her whole life so she can see if there were any other humans that live on the planet. Then one day when she is at home with Murthur (her mother robot), some crazy hunter/assassin comes and lights the Sanctuary (her underground home) on fire. Then Eva is forced to go into the outside world, which is nothing like she expected it. The world was over grown, the birds and plants both looked strange, and there wasn't a single human in site. The reason why she is searching for "WondLa" is because, back in the Sanctuary Eva had this "secret room" that she kept stuff in. Most of the stuff was little toys Murthur had given her, but one of them was a little scrap of paper showing a man, a girl, and a robot. They were all smiling and holding hands with each other, at the top of the paper the words were faded so all you could see was WondLa. I fell in love with this book the second I started reading it. I hope you like it that much, too.